This paper is approached from the perspective of speculative communication design. The author proposes the combination of a practice-based methodological approach more typically found in the expressive arts, with a specific design research based methodology for the production of a future HCI environment. The paper explores how this combination of elements can be applied to a practice-led framework of investigation to facilitate an exploration of future HCI in the emerging context of continual mixed reality (MR). Given the complexity of future scenarios – in which there are many unknown variables both in [terms of] interaction and environmental contexts – the author proposes we approach the problem via the use of practice-based ‘adaptive frames’. Framing is valuable when variables are numerous, as they allow for the re-contextualisation of a problem through themes of inquiry rather than being constrained by adopting fixed working mechanisms. 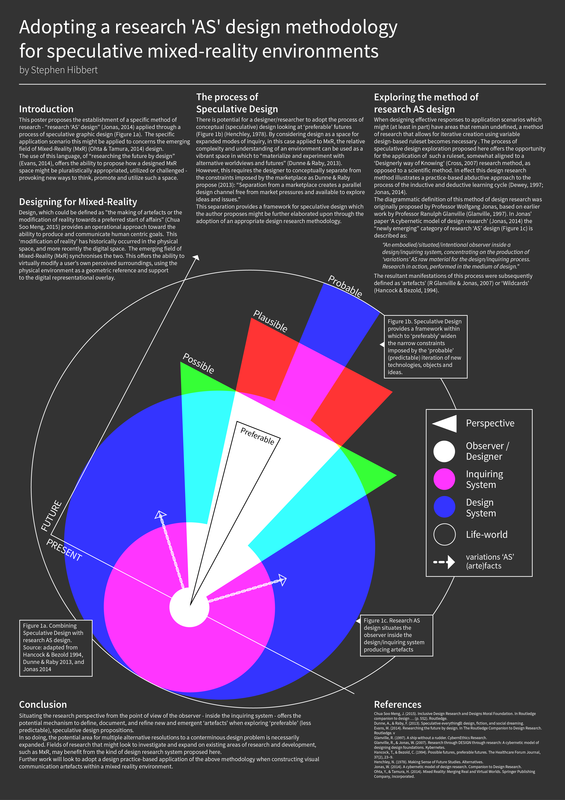 This poster proposes the establishment of a specific method of research - “research ‘AS’ design” (Jonas, 2014) applied through a process of speculative graphic design (Figure 1a). The specific application scenario this might be applied to concerns the emerging field of Mixed-Reality (MxR) (Ohta & Tamura, 2014) design. The use of this language, of “researching the future by design” (Evans, 2014), o ers the ability to propose how a designed MxR space might be pluralistically appropriated, utilized or challenged - provoking new ways to think, promote and utilize such a space. 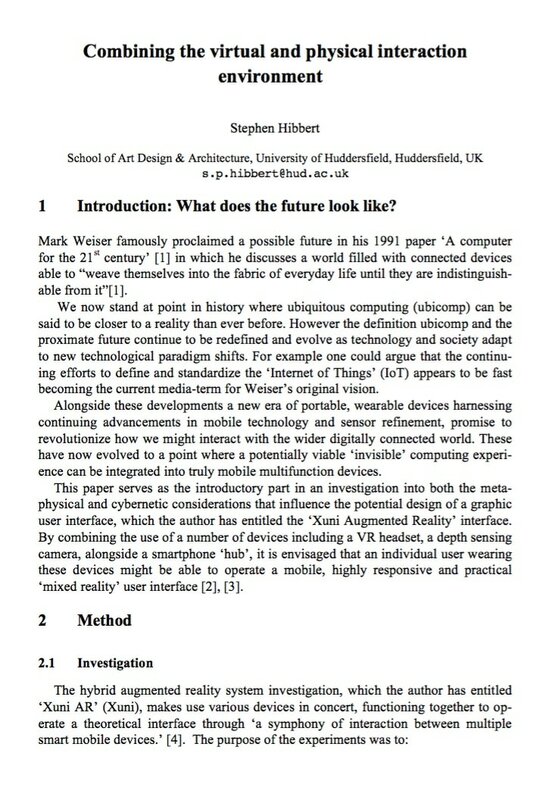 Mark Weiser famously proclaimed a possible future in his 1991 paper ‘A computer for the 21st century’ in which he discusses a world filled with connected devices able to “weave themselves into the fabric of everyday life until they are indistinguishable from it”. We now stand at point in history where ubiquitous computing (ubicomp) can be said to be closer to a reality than ever before. However the definition ubicomp and the proximate future continue to be redefined and evolve as technology and society adapt to new technological paradigm shifts. For example one could argue that the continuing efforts to define and standardize the ‘Internet of Things’ (IoT) appears to be fast becoming the current media-term for Weiser’s original vision. Alongside these developments a new era of portable, wearable devices harnessing continuing advancements in mobile technology and sensor refinement, promise to revolutionize how we might interact with the wider digitally connected world. These have now evolved to a point where a potentially viable ‘invisible’ computing experi- ence can be integrated into truly mobile multifunction devices.